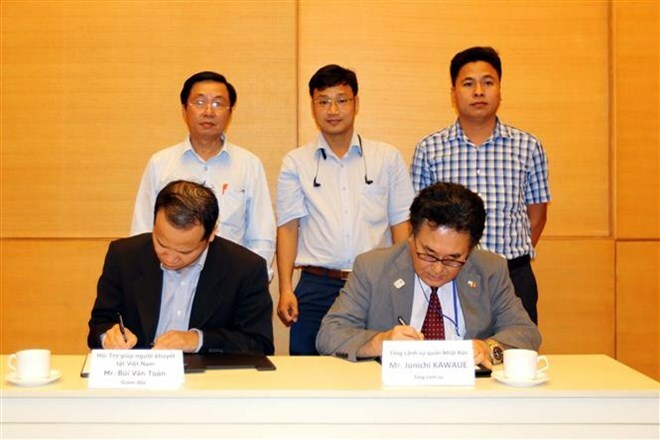 HCM City (VNA) – The Consulate General of Japan in Ho Chi Minh City held a ceremony on March 20 to ink contracts on the granting of the country’s non-refundable assistance to social welfare projects in six Vietnamese localities. The projects, worth more than 483,270 USD, will be launched in the provinces of Binh Phuoc, Kien Giang, Long An and Bac Lieu in the south and Dak Lak and Dak Nong provinces in the Central Highlands. They are to build rehabilitation faculty and provide medical equipment, medical waste treatment system and laboratory equipment for the provinces, along with building schools and working facilities for the blind. Projects to supply clean water and build five classrooms for elementary students are also included in the assistance. According to the Japanese office, the projects will be promptly implemented to help local children and people access modern healthcare conditions, clean water, education and waste treatment towards environmentally protection, as well as support sight-impaired people. General Consul of Japan in HCM City Junichi Kawaue said that the non-refundable aid aims to ensure basic demand of the beneficiaries, especially those residing in remote and mountainous areas.